This morning as I was going through my oral hygiene routine, I got excited about my mouthwash. And I thought I’d share it with you. This isn’t about love (well, as much as one can love mouthwash) and it isn’t about foreclosure, but it is about saving money. Bob and I miss many things about our life in L.A. To be expected, of course. We built a life there for almost eight years. At the top of our list of things we miss is our dentist: Dr. Jill Sekiguchi. She’s the best dentist I’ve ever had. She does the cleanings herself. She’s so thorough and gentle. And she loves her job. Loves. It. She gets so excited when by scraping away tartar. She’ll even show you the big chunks if you’re game… in a “Wow, look at this piece I just got!” sort of way. It’s really awesome, actually. And she’s the one who recommended the mouthwash. 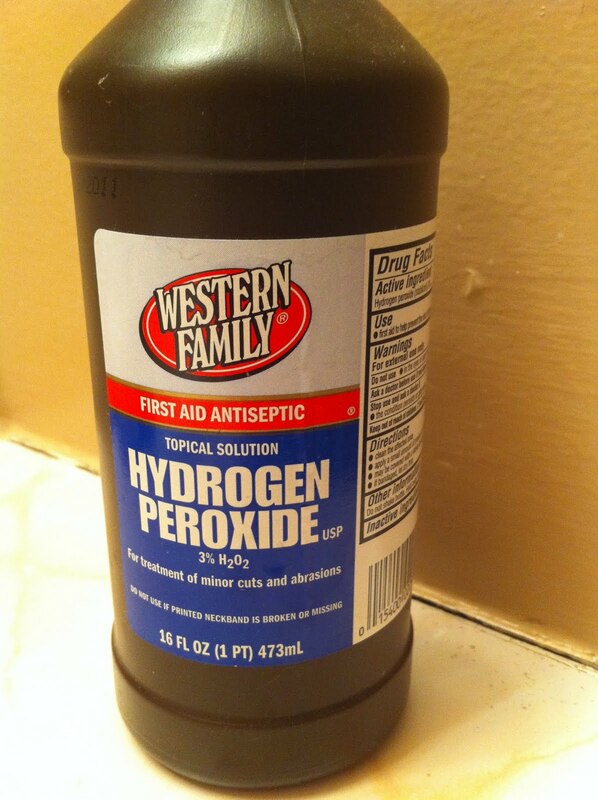 Dr. Jill told me the best (and cheapest) mouth wash to use is Hydrogen Peroxide. Yep. So simple. So cheap. At 99 cents a bottle. You can’t beat that. I love the way it makes my gums feel. And the way it attacks germs and bad breath. A dose of oxygen to the mouth. Mix one cap full of hydrogen peroxide with one cap full of water and you’ve got yourself a highly effective, money saving mouthwash. One tip: I usually rinse before I brush. That way I get the minty flavor after taste from the toothpaste as opposed to the slightly strange after taste of the hydrogen peroxide. I showed you mine. Now show me yours. Please share your every day money saving tips in the comments! P.S. Anyone else use hydrogen peroxide as a mouth wash? I have peroxide in my cabinet and I cannot WAIT to try this! thanks! NJD: First wet your toothbrush with hydrogen peroxide and dip it in baking soda. It is unbelievable how that works. Okay, I can’t believe I’ve never tried the straight up baking soda as toothpaste. I’m excited to try it. First I will try it solo. Then I will dip it in the hydrogen peroxide per Anonymous’ tip. Thanks, guys!